Pastor Agu Ifeanyichukwu, the founder of Faith Ministry International Umunede Delta State has been arrested and arraigned before a Lagos Magistrate Court for allegedly stealing his sister’s son, Odinnaka Chukwudi who was living with him. 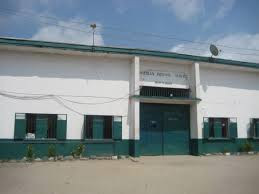 46-year-old Ifeanyichukwu was arrested by the operatives of the Federal Criminal Investigation and Intelligence Department, FCIID, Alagbon, Ikoyi, Lagos in Delta State following a petition by the mother of the missing child, Chinyeye Agu Uku. And after investigation by Insp. Musa Naneri and his team, Ifeanyichukwu was arraigned before an Igbosere Magistrate Court, Lagos on a 2-count charge of felony to wit. stealing one Odinnaka Chukwudi. Police prosecutor, Moruf Animashaun informed the court in charge No. C/47B/2017 that the accused who claimed to be the Pastor of Faith Ministry International in Umunede, Delta State committed the alleged offence sometime in 2015 at 58 Tejuoso Street, Yaba, Lagos. Animashaun told the court that the accused approached his sister, Chinyere Agu Uku in Lagos to allow him take his 10-year old son, Odinnaka Chukwudi home to enroll him in a school. He said that the complainant agreed with his brother and allowed him to take her son away because they were siblings. Animashaun said that after sometime, the complainant received a call from her brother that her son allegedly raped his daughter and ran away from home and that since then all effort to locate him had proved abortive. He said that following the complainant’s inability to locate her son till date, she reported the incident to the police that she suspected her brother to have sold her son or use him for ritual purpose. Animashaun said that the offences the accused committed were punishable under section 411 and 277 (1) (a) (b) of the criminal laws of Lagos state, 2015. The accused pleaded not guilty to the alleged crime and Chief Magistrate O.A Komolafe granted him bail in the sum of N10 million with two sureties in like sum. Komolafe adjourned the case till 12 September, 2017 for mention and ordered that the defendant be remanded at the Ikoyi Prison, Lagos pending when he is able to fulfill the bail condition.